Describes only the surface of a solid. This could be a data structure composed of vertices, edges, and faces, or a set of equations such as B-Spline. 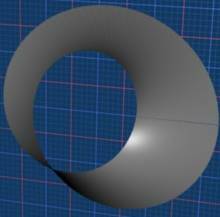 It often helps to define a surface in terms of a set of parameters other than the base coordinates. This page shows various shapes and how they can be defined in terms of parameters.